Board gaming can be more than just a hobby. For many enthusiasts, it is a lifestyle or a pastime. With lots of enthusiasts together, it becomes a community. And it’s a great hobby and a wonderful community. We do lots of things for our love of board gaming. To the outside, it might look strange, quirky, or completely nuts. We can get pretty wrapped up in games with blogs, videos, conventions, game nights, and Board Game Geek. Despite the abundance of means in which we immerse ourselves in the hobby, there are always still more unique things to discover and awesome resources to mine, all connecting us to a larger world. One new and particularly distinctive event is Cardboard & Sun. It might look a bit peculiar to those on the “outside,” but our readers will understand. Organizer Iraklis Grous was gracious enough to give iSlaytheDragon some of his valuable time to talk about it. First of all, thank you, Iraklis, for spending a little time with us. I’ve been very intrigued by this event ever since I discovered it. Let’s begin by telling us what exactly is Cardboard & Sun. Cardboard & Sun is the best way to have a vacation – enjoying board games with like-minded board game geeks. It takes place in a beautiful, sunny, interesting Greek island, in a venue with nearly 500 modern board games – many of them rare – and located 5 minutes away from a beach. So, last year’s was the inaugural Cardboard & Sun. What gave you the original idea to create and organize a vacation focused on board games? Just something you always personally wanted to do? Something others have requested? Did you see a market for it? This was just something that I wanted to do. I love to travel, and I love to play board games. However, these are often mutually exclusive – micro games or other portable games notwithstanding. I did not really investigate the market, I just went ahead and did it, and it seems that there is indeed a market. 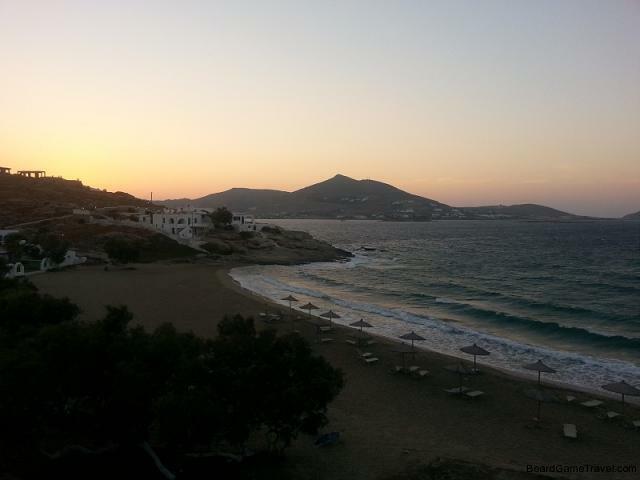 Why the island of Paros? I had visited the Faroe Islands in that same summer, and found it to be a place of exceptional beauty. I had also met some local, passionate board gamers. It rains a lot in the Faroes, and I often had the urge to get indoors and play some board games, so I thought it would be a good place to combine visiting a beautiful place, and enjoying my favorite thing to do. However, the Faroes are very expensive, and while there are local gamers, there is no board game library – which Alea has. Later on in the same summer I visited Alea in Paros, and found it to be another place of beauty and interest. Each Greek island has its own appeal, but Paros combines beautiful places and historically significant sites, a place I could see myself going again and again. Coupled with the hospitality of the locals, and the board game library on site, it seemed like an ideal place to start this. The island of Paros offers several different types of beaches with unique character all their own. What is Alea, and what is your connection/relationship to them? Is it just through Cardboard & Sun, or how did you discover them and choose their property for the vacation spot? Alea is Alea Apartments, an apartment hotel owned by two Greek board game geek brothers. It’s a family business, and I discovered them via a post that someone made on BGG. I regularly visit the country because I have family in Greece, and I thought that Alea would be a good venue for the event. So how many participated in the vacation last year? What parts of the globe did they all hail from? Together with the Alea people and some other guests, I believe it was about 20 board game geeks. There were people from Germany, Finland, Sweden, UK, USA/Malta (depending what you count Richard Ham as), Austria, UK/Hungary, Greece, and Turkey. This year, we will have 27 board gamers there, from as far away as New Zealand and Oregon. It seems that there is just one room left available. Were many of the attendees friends of yours before the trip? Or do you get to meet totally new people? I personally knew maybe 4-5 people last time around, and about the same this time around, although most of them are repeat participants from last year. Who actually owns the game library that vacation goers will have access to? Is this collection on the Alea Apartment properties – or at a nearby location? 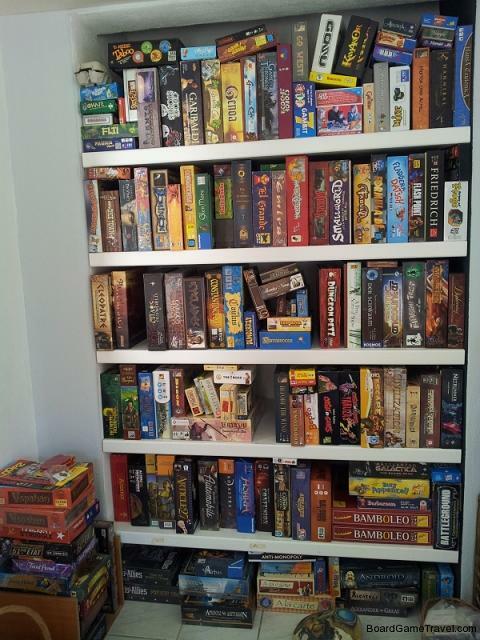 The collection is owned by Alea and is apparently nearing 500 games. It is located in the same place that everyone is staying, and participants can take and keep games in their rooms. Part of the nearly 500 title gaming library owned by Alea Apartments…all available to vacationers, even for check out! So, regarding the business-side, what is LudiCreations’ relationship with Cardboard & Sun? And what, specifically, is your role in both entities? I own and operate both entities. Any backer of a LudiCreations Kickstarter campaign also gets 10% off the BoardGameTravel.com event for that year. Where is LudiCreations based? How long have you been publishing games? Do you design your own games, only publish those of others, or a mixture of both? I live and work between Finland and the US. Our first two games were released last year (Byzantio, Gear and Piston), and we only have games designed by others currently in development. While I have several ideas, so far I have found it much more productive to be a game editor and developer, than to design a game. It simply takes too long for me to be able to do it effectively at the present time. Back to the holiday, is Cardboard & Sun a for-profit “business” – or more of you just facilitating a vacation for several people? It’s not non-profit, it’s more like NONE-profit. As in it is something that I do not expect will make money – as you need big numbers for that – and something that I would do anyway. It is priced to at least not lose money. I prefer to keep it small and cozy right now, as I just want to have a vacation and play games myself. Did you have to use a third-party travel agent to arrange for the included amenities, such as accommodations in Athens and the cruise to Paros? Or did you do all of the groundwork yourself? Nope, it’s all me. I buy the ship tickets directly from the ferry company, book the hotel in Athens myself, organize the airport pickups, etc. 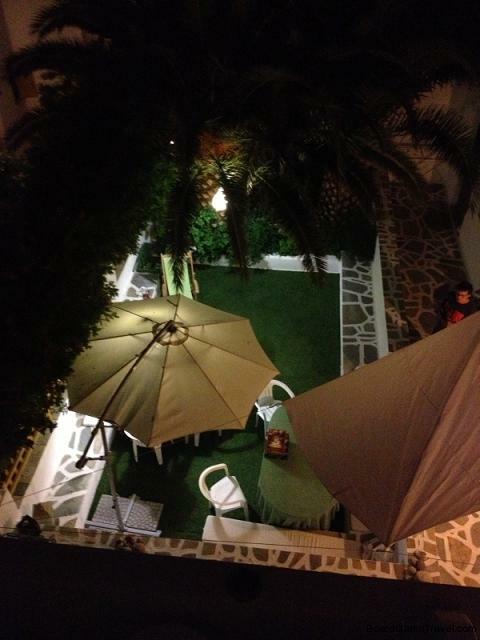 Alea helps with the Paros-side stuff – for example, they recommended the place where we have the welcome dinner. What was the biggest hurdle you had to overcome in organizing Cardboard & Sun? Communicating with the people I had to talk to in order to make the hotel and ferry arrangements happen. My previous job was in the travel industry, so I expected that. What is your favorite spot on the island and why? It’s a tie between Kolimbithres Beach, where we played Ugg-Tect *in* the water, as well as Ultimate (water) Frisbee, and where we briefly got in the way of a marriage proposal; and the ancient marble mines in Marathi, where the Alea boys’ father gave us a fascinating tour and taught us so much. The Alea Apartments – headquarters and residence for your week-long stay. BoardGameTravel.com also mentions a possible “Cardboard & Snow” for 2015. 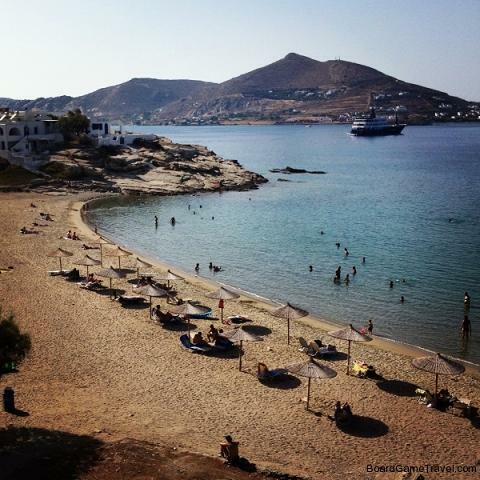 Where might that location take people and how might details differ from the holiday in Paros? That was originally supposed to take place in Finnish Lapland in the winter of 2014, but with LudiCreations taking up so much time, I didn’t have time to properly start it. Also, I’d have to truck my own game collection 1000km north for it. While it may still happen there, I am now looking at some locations in the French Alps – I am going to do a site visit first next month, after I attend Bruno Faidutti’s Ludopathic Gathering. Besides the obvious differences, I expect this to be more expensive, and smaller, than the summer event. I am also not sure if I would like to hold this every year. It might be, or perhaps start as, an invitation-only event. Speaking of LudiCreations taking up a lot of time, I see this holiday is scheduled very close after GenCon. Is this to help relax and unwind after that major convention? Or is the timing just a coincidence?! Yes, coincidence. Basically, I timed the event to be at the tail end of the high season, to avoid the big tourist crowds; and to take place when it is not too hot. Paros is really good about that anyway, as there’s usually a cool breeze blowing. Well, either way, it all sounds superbly relaxing, anyhow… Thanks again for your time, Iraklis! This Summer (August 25-30, 2014) Cardboard & Sun returns to the Greek island of Paros, located in the middle of the Aegean Sea. The holiday combines a love for board games and exotic travel. Based at the Alea Apartments (owned and operated by Board Game Geek enthusiasts), vacation goers will have the freedom to relax, sun, swim, eat, site-see, and, of course, play games from the property’s extensive game collection. Cardboard & Sun is not an inclusive, all-expenses vacation package with a restrictive itinerary. The listed price on BoardGameTravel.com includes only hotel accommodations in Athens the nights before and after the trip, the ferry cruise to Paros and back, a gift box with some promotional items, and a welcome dinner the first night on the island. Travelers must arrange separately for their flight to Athens, the reservations at Alea itself for the week, and any expenses during their stay such as dinning, site-seeing, and shopping. The island of Paros has a lot to offer. Iraklis and the good folks at Alea are there for assistance, to provide excellent local tips, and to just spend time and explore with. If you’re interested in this unique holiday, visit BoardGameTravel.com for future events.